Corporal Harry Thorpe MM who is regarded as a premier footballer and athlete in brigade sports as well as a scout is shot in the stomach and dies after being taken to a dressing station near Bayonvillers. The 6th London Regiment are at La Houssoye in the Somme sector and are ordered to take Chipilly Ridge, which involves the capture of a small track running along near the ridge of the crest. Three tanks are employed in support and at 16:15 the battalion moves off from its positions to begin the attack. As they round the edge of Celestines Wood they come under heavy machine gun fire and heavy casualties are sustained. Rifleman Reginald John Newberry (King’s Royal Rifle Corps attached London Regiment) is killed at age 18. His two brothers have been previously killed in the Great War. On a bombing raid the machine in which Second Lieutenant. Samuel Lilburn Dunlop (Royal Air Force) is the observer is attacked by a number of enemy airplanes, one of which he shoots down in flames. On the return journey, he and his pilot, Lieutenant G Beveridge, are again attacked. He succeeds in shooting down a second machine in flames. In this latter attack Lieutenant Beveridge is severely wounded and faints. Second Lieutenant Dunlop immediately takes the controls. Leaning over the fuselage to support his pilot, steering the machine and at intervals firing on the enemy aircraft as they close on him, he makes for our lines, and with the help of the pilot, who has recovered consciousness, lands in safety. Captain Norman Goudie (Royal Air Force) and his observer, Second Lieutenant R McK Jamison, at low altitudes observe about three hundred enemy infantry massed in a sunken road and offering a strong resistance to our advancing troops. By keeping them under continual machine gun fire, they succeed in demoralizing the enemy, so much that they hold up a piece of white cloth as a sign of surrender. Captain Goudie ceases fire but remains in the vicinity until our troops push forward and take the enemy prisoners. During an attack when the advance is much impedd by hostile machine guns concealed in crops and shell holes Sergeant Thomas James Harris VC MM (Royal West Kent Regiment) leads his section against one of these capturing it and killing seven of the enemy. Later on two successive occasions he attacks single handed two enemy machine guns which are causing heavy casualties and holding up the advance. He captures the first gun and kills the crew, but is himself killed when attacking the second one. He will be awarded the Victoria Cross posthumous Victoria Cross for his actions. Private Robert Matthew Beatham (Australian Infantry) is killed at age 24 during the attack north of Rosieres, east of Amiens. When the advance is held up by heavy machine gun fire, he dashes forward, and, assisted by Lance Corporal Nottingham, bombs and fights the crews of four enemy machine guns, killing ten of them and capturing ten others, thus facilitating the advance and saving many casualties. When the final objective is reached, although previously wounded, he again dashes forward and bombs a machine gun, being riddled with bullets and killed in doing so. For his actions on this day he will be posthumously awarded the Victoria Cross. Captain George Hely-Hutchinson Almond (Royal Army Medical Corps attached Dragoon Guards) is killed in action by a bomb at Caix at age 41. He is the last and oldest of four brothers to die in the Great War. They are grandsons of the Reverend George Almond. Captain Alexander John Mayo (Royal Air Force) is killed. He is the son of the Reverend Dr. James Mayo of Trinity College Cambridge who lost another son exactly three years ago. Captain John Hugh Gunner (Hampshire Yeomanry) dies of wounds at Kemmel at age 33. He is a cricketer who represented Hampshire in six first class matches in 1906 & 1907. His two younger brothers have been killed in the war previously. Captain Charles Edward Henry Tempest-Hicks MC (Lancers) dies of wounds received in action at age 30. 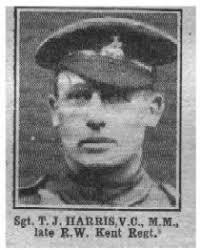 He is the only son of Brigadier General Tempest-Hicks, has served on the Western Front since the first month of the war and has been previous wounded three times. Captain Charles Pooley (Dragoon Guards) is killed at age 45. He was among the first 99 to be awarded the Military Cross. Lieutenant Fitzroy Charles Phillpotts (Gloucester Regiment) is killed. He is the son of the Reverend Ernest Alfred Phillpotts Rector of Stapleton. Lieutenant Walter John Pitt Pitts (Royal Air Force) is killed in action at age 19 while on a bombing mission to Peronne Bridge. His brother will be killed in October of this year. Lieutenant Victor William John Hobbs (East Kent Regiment) is killed in action at age 31. He was the Master at Highgate School Highgate London. Lieutenant Edmund Quartermain Cory (Reserve Cavalry) dies on service at home. He is the son of the Reverend Robert Frederick Cory Rector of Higham Gobion. Second Lieutenant George Mellsome Addison (South Staffordshire Regiment) dies of wounds at age 23. He showed “great promise as an actor”. Second Lieutenant Thomas Radcliffe Agnew May (Royal Air Force) is killed on his second day at the front at age 19. He is the son of the Reverend Frederick Granville May Rector of Cardynham and his brother was killed in April 1917. Second Lieutenant Wilfred Richard Lofts (Royal Air Force) is killed at age 20. His brother was killed in May 1915. Squadron Sergeant Major Richard Tirrell Shrimpton (Queen’s Own Oxfordshire Hussars) is killed at age 27. His brother Ernest died of influenza in January serving in the United States Navy. Corporal Albert Charles Toole (Australian Infantry) is killed at aged 20. His brother will die on service in February 1919. Lance Corporal Rupert George Jarrett (Royal West Kent Regiment) is killed on his way back to a dressing station having just been wounded in the hand. His brother died of wounds in December 1917. Lance Corporal George Roberts MM (Australian Infantry) is killed in action at age 28. His brother will die of pneumonia in November of this year. Gunner William George Tasker (Australian Field Artillery) dies of wounds received in action at age 26. He was an Australian rugby football player. Private Thomas Albert Ruckley MM (Hampshire Regiment) is killed at age 21. His brother was killed in February 1917. Private Murdo MacKenzie (Manitoba Regiment) is killed at age 28. He is the last of three brothers who are killed in the war. Private John Archibald Lugton (Australian Imperial Forces) dies of wounds. His brother was killed in July 1916. Private Hugh Grier Mertens (London Regiment) is killed at age 36. He is the son of the Reverend Frederick de Mounteney Mertens Headmaster of Ardingley College and Vicar of Arlington. Private George Henry Adams (London Regiment) is killed at age 24. His son will be killed in October 1942.